With the incoming cold front, temperatures will take a quick dip after Midnight as the front slices south of your location. Additionally, the prospect of showers transitioning from rain to snow looms for portions of the region. Stressing the operative word here is showers...we're not looking at a widespread, epic swath of back-breaking and street-crippling snowfall. We are looking at the front's band of shower activity to change over from rain to snow as it drops south. High temperatures on Tuesday probably occur in the pre-dawn hours, probably in the mid to upper 40's in the city. We'll see temperatures drop by ten degrees or show with the front, which would put us solidly into the mid, perhaps upper 30's at the surface, with colder air aloft and cold winds blowing throughout. The changeover from rain to snow shower activity won't occur until after the front crosses through but should allow for the first flakes of the season to fly for portions of the region. The question is how quick do temperatures fall enough aloft and at the surface to allow for that changeover and how much moisture will there be to work with. This front is relatively dry -- overall precipitation is expected to be around a tenth or two tenths at most. Even if the front's moisture is largely post-front, that doesn't leave much of a window for accumulating snow. 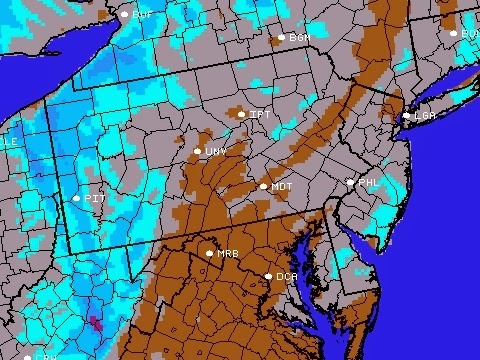 Most models don't show that possibility for Philly -- the NAM suggests coating type accumulations in the city, a bit more than that southeast (a bit more precipitation is expected near the Shore as the front picks up a bit more moisture on its trek southeast). 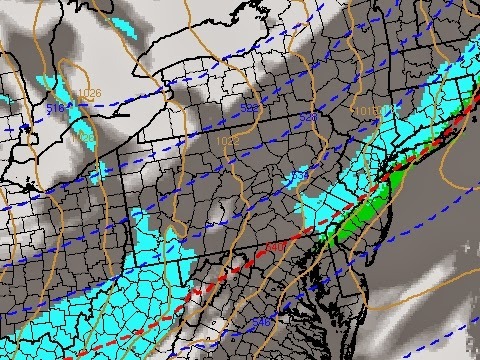 The NAM is the only model showing the possibility of an inch that far southeast. Among the other guidance, the GFS paints an inch northwest of the city in a couple of pockets, with the Euro mostly confined to the Poconos with the inch possibility. In the end, any snow that flies may be more of a flizzard, wind-whipped type but a steadier band of snow could lay down a coating on a few lawns in its path. Timing-wise, it looks like the front is modeled to cross through between 3 and 6 AM, with the transition from rain to snow shower activity taking place shortly thereafter. This would time itself for the front end of the rush hour but any snow shower activity should be of short duration and end within a couple of hours of the front passing through. In the city, we should be out of the snow chance window by 7 or 8 AM.